A year ago yesterday, a crazy event took place: a Lord of the Rings day. My boyfriend and I, along with another couple, watched all three Lord of the Rings movies. This wouldn’t be much of a challenge, except these were the extended versions – a total playing time of about 11 hours. To pass the day in style, we prepared and ate food for all 7 Hobbit meals, including “coney stew” (rabbit), which we cooked over a wood fire. Of course, this was accompanied by a decent amount of ale and mead. Elevensies – bread, cheese, fruits. This is when the ale started. By the time next February comes around, we might actually be ready to do it again. Now that you mention it, I’ve looked at my copy of the LOTR, and they do indeed mention coffee. Well, see, I know this already from your photostream…but it’s nice to read about it nonetheless. Never seen LOTR at all, but it sounds like good times! Totally cool…thanks for sharing! My LotR event is this weekend. Should be lots of fun! Hobbits inmported coffee from the Dwarfs, it is believed. Thankfully cofee originates in Africa not the Americas so Tolkien allowed it. 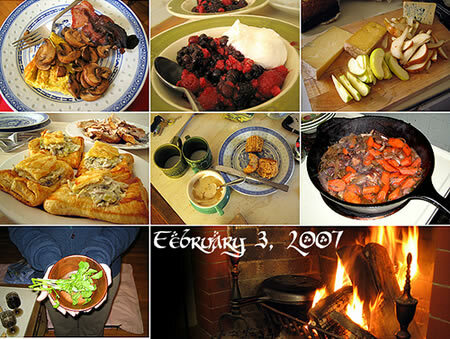 I was “GoodSearch”ing for Hobbit Meals and it brought me to your site. I was making a quiz for my brother’s kids and wanted to know the names of the meals and how many, etc. and so forth after watching the first movie. Now I just love your idea of doing a LotR viewing with the 7 meals! FANTASTIC!! I think we will need to do that May I as, why in February? You know, I’m not sure why February – it wasn’t originally my idea. But it’s actually a great time of the year to cozy up under some blankets and fire up the oven (or fireplace) all day. That looks like an amazing day of LotR fun. We’re planning on doing something similar. Yum! Actually – THE perfect date for this event this upcoming year (which I am planning now) is Jan 2. It’s the Saturday after New Years AND . . . wait for it . . . at midnight – you can toast the traditional J.R.R. Tolkien Birthday toast – “The Professor” since his birthday falls on January 3rd. That way – you have Sunday (his actual birthday) to recover before returning to work. I like your menu. May have to give it a shot. Thanks! This is, by far, the coolest nerd activity I have ever heard of:) And I do mean ‘nerd’ in the most complimentary, Rachel Maddow-way possible! What about taters? You know… PO-TAY-TOES. Boil ‘em, mash ‘em, stick ‘em in a stew.